Giorgos Velegrakis reports from Athens’ struggles against EU immigration policy, and for the creation of a new political community. Crowdfunding campaign for the City Plaza initiative (best-hotel-in-europe.eu). Since 2015 and the emergence of the refugee movement to Europe, Greece has become a major stopover on the journey of people seeking a better and safer life. Thousands of immigrants from Syria, Kurdistan, Iraq, Afghanistan and other war zones have abandoned their homeland in search of a new home, where their life and freedom are not compromised. Unfortunately, the EU and Greek governments have been unable (and largely unwilling) to respond to the issue. Instead of providing safety and solidarity to war victims, they have signed a (rather shameful) agreement with Turkey, with the purpose of “managing refugee flows” and further securitizing the “forbidden” European borders. As a result, thousands of refugees are currently trapped in Greece, cramped inside detention centers and camps, away from the public eye. Demonstration against racism, fascism, austerity and the EU-Turkey immigration policy, 18 March 2017, Athens. Source: facebook.com/sol2refugeesen. 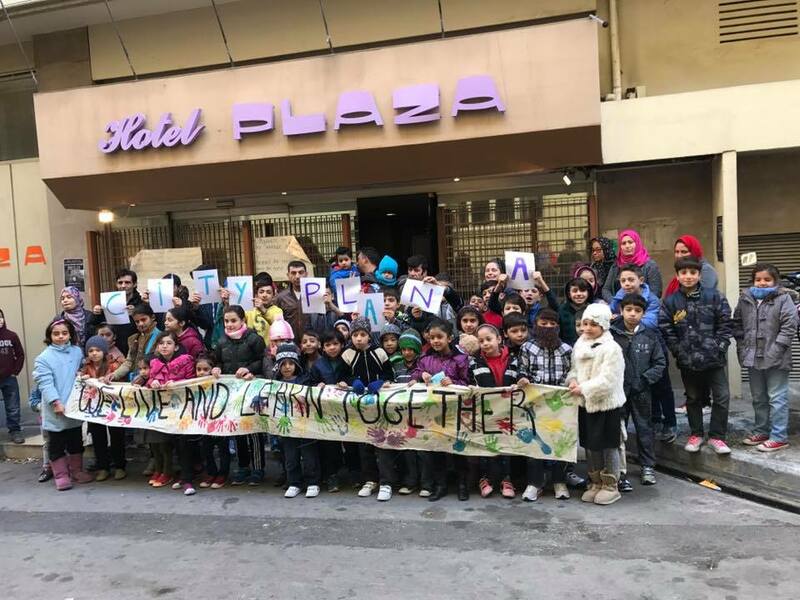 In this context, on 22 April 2016, activists and refugees squatted the City Plaza Hotel in Athens, which had been abandoned for seven years, in order to create “here and now” a model of dignified housing inside the city. Since then, City Plaza became a home for 400 refugees, including 100 families and 168 children. More than 100 solidarians (locals, activists and volunteers) have mobilized to break with the reality of detention, to build new social relations and multicultural forms of coexistence between locals and immigrants, and to animate a living example of self-organization. “We live together, we work together, we struggle together” is the main motto of the initiative. The occupied Hotel City Plaza in Athens. Source: facebook.com/sol2refugeesen. 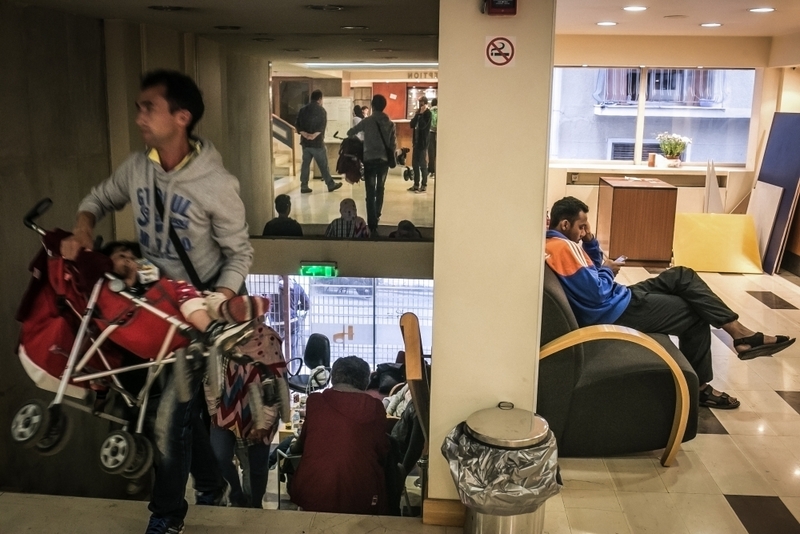 Solidarity space and home to 400 refugees: the occupied Hotel City Plaza in Athens. Source: irinnews.org. 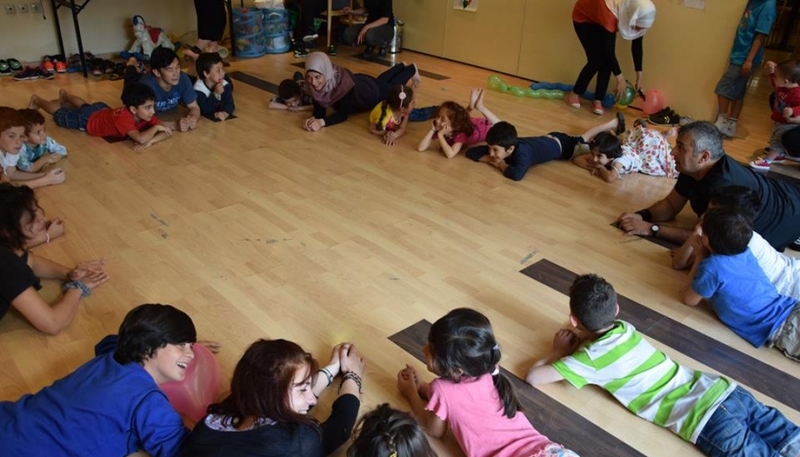 Education and child care: provides classes for children in their own mother tongues, in Greek and in English; also organizes creative activities. Language classes: several groups of teachers provide classes in Greek language for children, and English and German for adults and children. Health care: composed of doctors and nurses, this team runs a health care center at City Plaza on a daily basis, and coordinates contacts with public hospitals if needed. 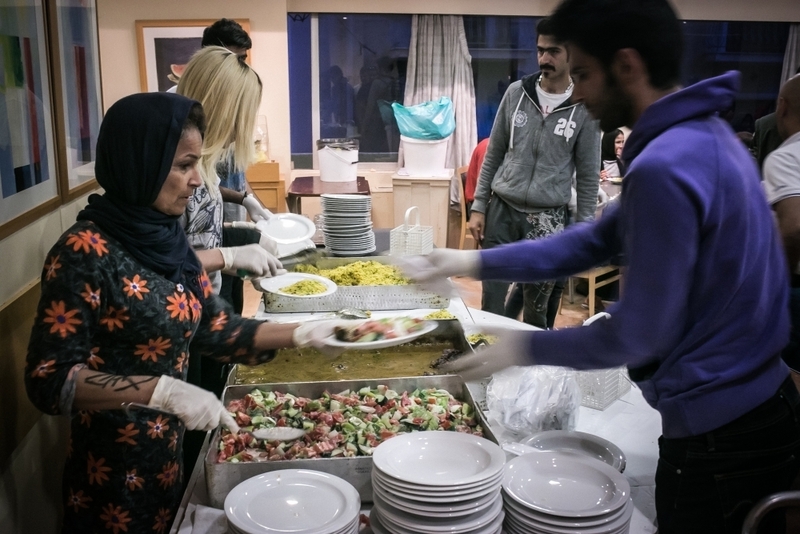 Kitchen: teams of refugees and solidarians prepare approximately 1000 cooked meals each day, in addition to breakfast. Organizing collective activities for children. Source: europeanaffairs.media. “The basic thing is that we live in a world which is becoming more and more individualistic. It is a question of political emancipation. For many people working and living in this collective way, it is out of their comfort zone to begin with (…). There are many women in particular who arrive at City Plaza and have never been part of a meeting where all decisions are taken. They have never been involved in a space where they are able to participate equally in day-to-day life. After a few months, these women have gradually taken more and more initiative and responsibility. A self-organized space fights oppression and enables empowerment for all those involved”. “We are not ‘giving’ solidarity. We are saying ‘we are here to support you, but we cannot do everything for you’. This is the actual challenge: to achieve a real sense of collaboration, independence and freedom for everyone here”. “No matter where you are from or which language you speak, in the City Plaza kitchen you are equal. We do everything as one team”. Dinner served by the kitchen team. Source: irinnews.org. “We are convinced that the balance of power can be shifted in concrete practices rather than through general humanitarian appeals. In these practices the renewed version of the mantra of T.I.N.A. (There is no Alternative) of repressive migration policies can be disputed and space can be gained against the far-right. 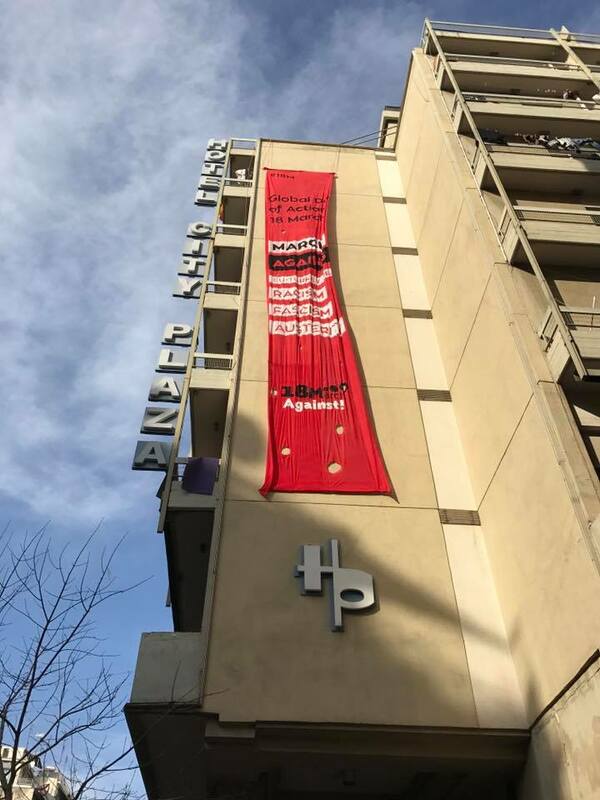 City Plaza made itself a place of solidarity and resistance in a neighborhood that is claimed since years by the extreme right and the neo-Nazi Golden Dawn party”. “To my mind, this transformative potential in everyday practice is the common background of our movement and all the current grassroots social initiatives”. “At City Plaza we live and learn together”. Source: twitter.com. “City Plaza alone cannot bring back the lost summers: the Mediterranean sea continues to be a watery grave for thousands of refugees, the internal and external borders of Europe operate as Apartheid zones of human rights, while Europe is drowning in the madness of austerity and is being transformed into an expensive social hotspot”. Therefore, the struggle against every form of oppression is both a global and a constant struggle. Let us not forget that.